. 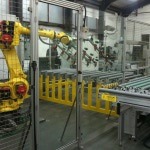 ROBOLOAD-PRO glass handling robots for loading and unloading single and multiple glass panes from and to vertical and horizontal planes. . 15 second cycle time on glass sizes up to 3 x 2m.